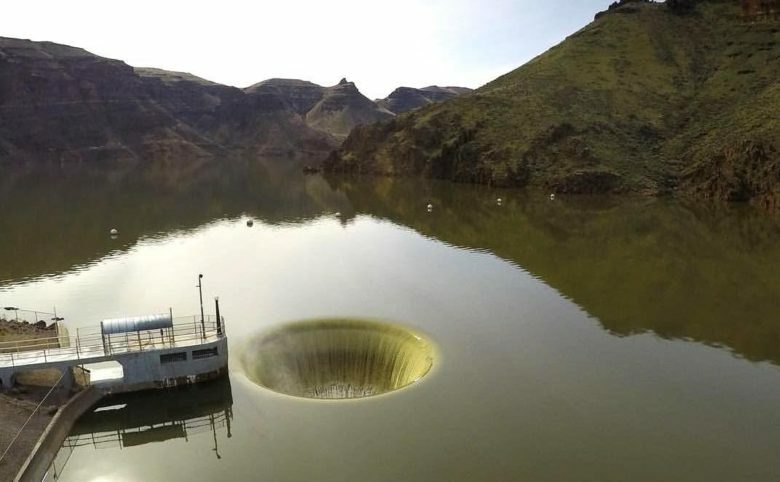 Repairs are expected to start by summer on part of Owyhee Reservoir’s “glory hole” ring-gate spillway. The system, built into a rock outcropping just upstream of the dam, moves runoff water through a concrete chamber and into the river below with help from a floating steel ring on rack-and-pinion gears. Crews in turn will find concrete reinforcement bars within the existing structure and begin to rebuild damaged areas. Access poses a challenge because the damaged area is halfway around the structure and facing the reservoir rather than the dam, he said. Most equipment will be small so it can get to the site on scaffolding attached to the ring-gate structure. Pneumatic pumps will carry concrete. The system remains functional. The project’s start could be in May or June depending on how runoff season affects access, he said. The U.S. Bureau of Reclamation owns Owyhee Dam outside Adrian, Ore. The dam is operated and maintained by OID, Owyhee Project South Board of Control and the Old Owyhee Ditch Improvement District. Snowpack was well below average in the Owyhee drainage last year. It was around 99 percent of average Jan. 28, 2019, when Reclamation pegged the reservoir at 38 percent full and Chamberlin said Owyhee Reservoir contained about 240,000 acre-feet of water. The reservoir needs 500,000 to satisfy full allotments for all irrigated acres, he said.